Never Enough Nails: Lynnderella Friday, Vol. 9! Happy Friday of a long weekend for my US readers! I can't believe Labor Day is upon us already. I am simultaneously excited for fall and sad to see summer go. Today I have some gorgeous Lynnderellas for pretty much any time of the year. First up is this STUNNING mystery Lynnderella. Mystery Lynns are prototypes or experiments that you can sometimes add to your order. They may resemble LEs or SEs, but I don't know which polish this resembles. If I find out, I'll definitely let you know. This mystery Lynnderella has a deep lavender jelly base chock full of holographic glitter. The glitter is all the same size and shape, and really holo! The base color is a nice medium purple grape. For a super sparkly polish, this was super easy to apply. This is just two coats and the coverage was great. It was easy to work with and smooth with one layer of top coat. 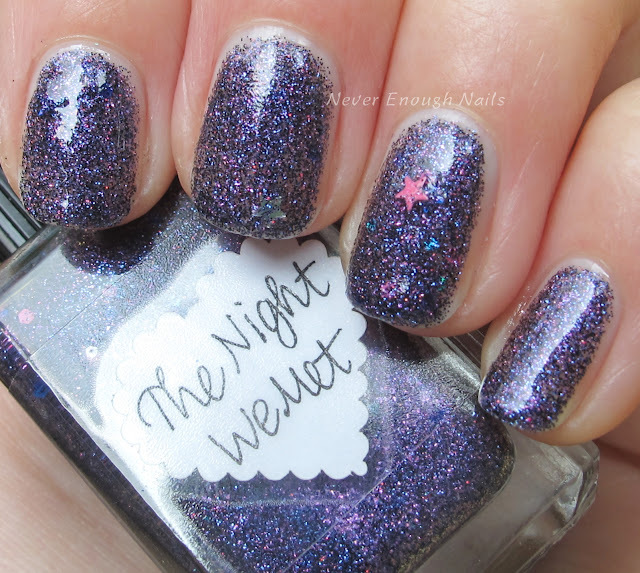 Lynnderella The Night We Met is from the Valentime collection. 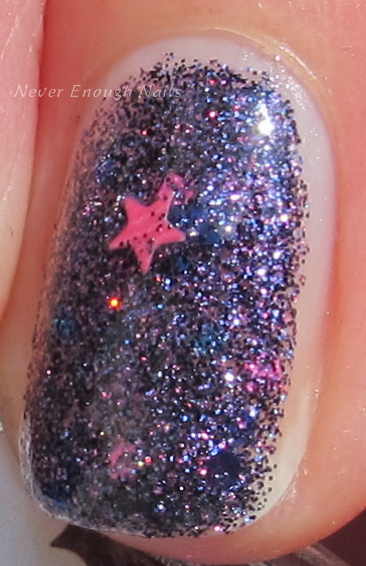 It is a deep purple-tinged navy microglitter with pink, blue and navy larger glitter accents. It has gorgeous pink shimmer and a clear base. The purply blue microglitter really reminds me of a night sky. This is three coats of The Night We Met. It was pretty easy to apply and opaque in three coats. I did feel like this one was taking a long time to dry, even with quick dry top coat. That's strange, as I've never experienced that with Lynn's micro glitters before and no one else has mentioned that about this polish. So maybe it was just me being impatient today! 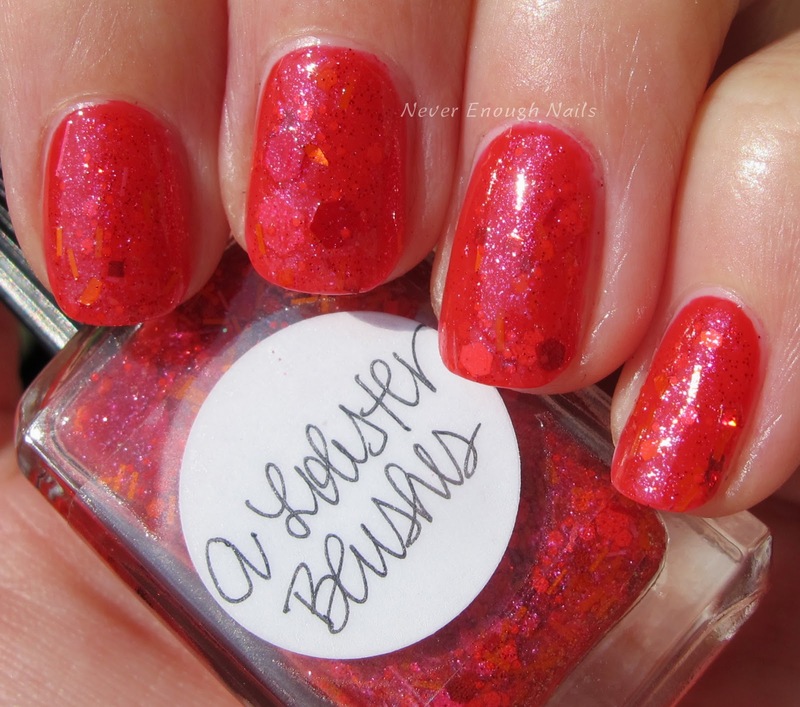 Lynnderella A Lobster Blushes is an older LE, but it's actually up on lynnderella.com right now so I wanted to post it. 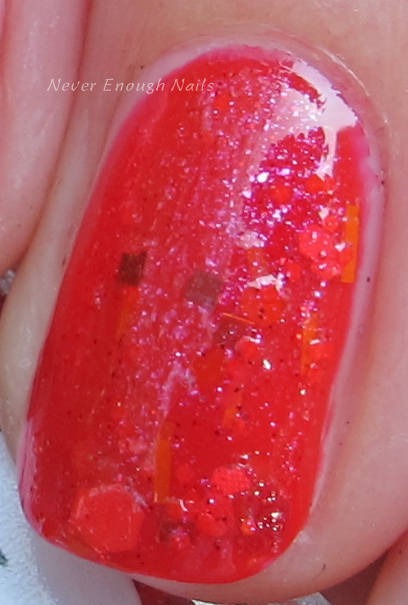 Lynnderella says this one "is made with metallic and neon reds, neon hot pink and orange glitters accented with red microglitter in a sheer pink-shimmered orange-red base". I copied her description because this has such a mix of red, pink and orange glitters and a pinky red orange base, so it's pretty complex! This was hard to photograph too, the shimmer and different glitters stand out more in person. This is two dabbed coats of A Lobster Blushes over Essie Lollipop. It was easy to apply with the dabbing method. To purchase these and other Lynnderellas, please go to lynnderella.com and lynnderella.storenvy.com.